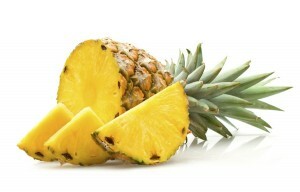 Sweet Pineapple is one of the best sources of the trace mineral Manganese. Manganese, is an essential cofactor in a number of enzymes important in energy production and antioxidant defenses. In addition to manganese, pineapple is an excellent source of thiamin, a B vitamin that acts as a cofactor in enzymatic reactions central to energy production. Pineapples have exceptional juiciness and a vibrant tropical flavor that balances the tastes of sweet and tart. They are second only to bananas as America’s favorite tropical fruit. Although the season for pineapple runs from March through June, they are available year-round in local markets. If you browse the Jacksonville Farmers Market on any given day, chances are at least one vendor is slicing and serving up samples of fresh, sweet pineapple. Pineapple also provides potential anti-inflammatory and digestive benefits. Bromelain is a complex mixture of substances that can be extracted from the stem and core fruit of the pineapple. Among dozens of components known to exist in this crude extract, the best studied components are a group of protein-digesting enzymes (called cysteine proteinases). Originally, researchers believed that these enzymes provided the key health benefits found in bromelain, a popular dietary supplement containing these pineapple extracts. In addition, researchers believed that these benefits were primarily limited to help with digestion in the intestinal tract. However, further studies have shown that bromelain has a wide variety of health benefits, and that many of these benefits may not be related to the different enzymes found in this extract. With all of these benefits and more, it is an easy decision to adopt pineapple to your daily diet. Especially when it is so readily available, as a year round fruit.